CALGARY, AB — The Western Hockey League announced today that Swift Current Broncos goaltender Logan Flodell has been named the Vaughn WHL Goaltender of the Month for September and October 2017. Flodell, a 20-year-old native of Regina, Sask., has been a major pickup for the team after being acquired in a trade two days before the start of the 2017-18 regular season. In 11 games, Flodell posted a 9-1-1-0 record with a 2.45 goals against average and 0.928 SV% with two shutouts. 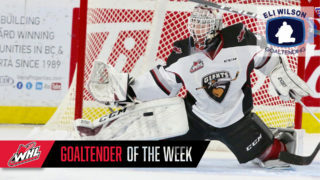 His efforts earned him recognition as the WHL Goaltender of the Week for the week ending October 15 while also earning the Vaughn CHL Goaltender of the Week honours too. 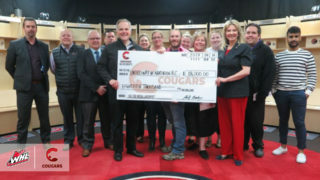 Twice he was recognized by the WHL as the first star of the night in their nightly three stars. The 5-foot-11, 170-pound Flodell is tied for the league lead in goals-against average (GAA) and leads the league outright in save percentage (SV%) for qualified goaltenders. His two shutouts also lead the league while his nine wins have him ranked second among WHL puck stoppers. 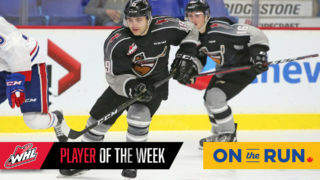 Drafted in the third round (47th) of the 2012 WHL Bantam Draft by the Seattle Thunderbirds, Flodell has split his 111-game WHL career between the Broncos, Thunderbirds and Saskatoon Blades. Now in his overage season, Flodell has compiled a 57-36-9-1 record with a 2.76 GAA, 0.909 SV% and eight shutouts. 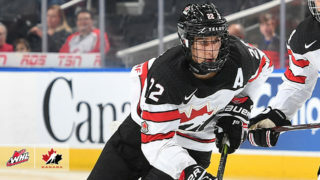 Having previously represented Hockey Canada at the 2014 World U-17 Hockey Challenge, Flodell is well on his way to setting new career-bests in wins, GAA, SV%, shutouts and minutes played. 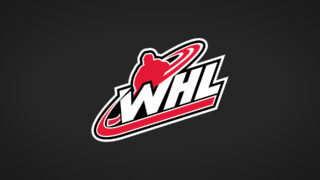 Flodell is also 11 wins away from accomplishing a rare feat of winning 20 games with three different WHL clubs.